Ficus est genus circa 850 specierum arborum, fruticum, lianarum, epiphytorum, et hemiepiphytorum familiae Moracearum; quae per tropicas endemicae sunt, nonnullis speciebus in semicalidam zonam temperatam attinentibus. Ficus communis, Ficus carica rite appellata, est species temperata in Asia meridioccidentali et regione Mari Mediterraneo (ab Afgania ad Portugalliam) inventa, quae latissime ab antiquitate pro fructibus, etiam ficos appellatis, exculta est. Fructus plurimarum specierum etiam sunt edules. 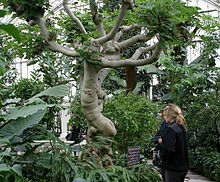 Ficus craterostoma Warb. ex Mildbr. & Burr. Ficus mollior F.Muell. ex Benth. Radix aeria quae firmamentum structurale arbori olim praebebit. ↑ "Ficus L". Germplasm Resources Information Network. United States Department of Agriculture. 16 Ianuarii 2009 . ↑ Sunset Western Garden Book, 1995:606–607. ↑ Brasilia, Paraguay, Argentina: Carauta & Diaz (2002): pp.64–66. ↑ Brasilia: Carauta & Diaz (2002): pp.67–69. Berg, C. C. & Corner, E. J. H. (2005): Moraceae. In: Flora Malesiana Ser. I, vol. 17, part 2. California Rare Fruit Growers, Inc. 1996. Fig. Carauta, Pedro, et Ernani Diaz. 2002. Figueiras no Brasil. Rio de Janeiro: Editora UFRJ. ISBN 85-7108-250-2. Condit, Ira J. 1969. Ficus: the exotic species. University of California, Division of Agricultural Sciences. Denisowski, Paul. 2007. Chinese–English Dictionary – Fig. Retrieved November 1, 2008. Lewington, Anna, et Edward Parker. 199. Ancient trees: Trees that live for 1000 years. Londinii: Collins & Brown Limited. Rønsted, Nina, George D. Weiblen, James M. Cook, Nicholas Salamin, Carlos A. Machado, et Vincent Savoainen. 2005. 60 million years of co-divergence in the fig-wasp symbiosis. Proceedings of the Royal Society B: Biological Sciences 272(1581): 2593–2599. doi:10.1098/rspb.2005.3249 PDF fulltext. Shanahan, M., S. G. Compton, Samson So, et Richard Corlett. 2001. Fig-eating by vertebrate frugivores: a global review. Biological Reviews 76(4): 529–572. doi:10.1017/S1464793101005760 PDF fulltext Appendices electronicae. Haec stipula ad Moraceam spectat. Amplifica, si potes! Novissima mutatio die 8 Octobris 2017 hora 18:11 facta.